Thank you to all who replied to my post. I deeply appreciate everyone who wrote in and really am enjoying reading all the stories. We have 3 lucky winners who were the first to respond to my post. They will receive the last of my 2009 catalogs, brochures, and a few promo cards from some past shows. To everyone else who responded today: I appreciate your efforts and you were so close, so I am going to find a little something to send over anyways. My first profound experience as an artist was when I was 15. I interned with Muralist John Wherle to paint a mural. Being a poor kid from the ghetto it was a profound experience. John talked to me like an adult and gave me the confidence to pursue art. We remain friends 15 years later and I am a board member of the Richmond Art Center- the same art center that hooked me up with John and gave me a chance. I now work with the art center to make art accessible to people without the resources. I will focus on an experience I had with art. It is back in 2006 when I was about to move from San Francisco to Austin, leaving after 10 years with wonderful memories and a ton of good friends. A bunch of us met up at the Jon Collins bar, strangely enough, a bar I had never visited in my 10 years living there. I was having a hard time saying good bye to everyone and the city that I loved. It was then that I saw one of your paintings hanging on the wall. To me it had a dramatic impact because it somehow captured a feeling I had for the city, and it also blew me away from a artistic and technical standpoint. It was a beautiful and captivating view/image of the city that I had never seen before and got me to hunt you down, inquire about the painting and then start to follow your career. I'm amazed by your work and know you will continue to grow and impress. 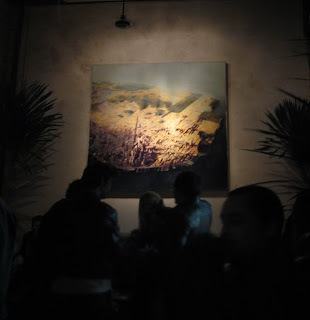 If you are ever in SF and want to see one of my paintings in person, stop by John Colins.